Certificate as awarded to La Quebrada following this nomination. When you are in the mood for a good piece of meat, grilled in the style of any one of a number of Mexican regions, and you are in any one of a number of south or west Chicago areas, La Quebrada is there. Reliable even on the rare occasions when the food is not excellent, and different, yet consistently good, throughout all the locations that have been reported on, La Quebrada does it right. So, I am breaking from tradition, and nominating the whole damned chain, not just a single location. Aurora, Cicero, Glen Ellyn, 63rd street, and any other location I have missed (see note below - it is no longer the whole chain). Good meat, tasty salsa, good side dishes. Can't go wrong. Without going back to Chowhound, where the "discovery" and exploration of La Q occured, here are some sample threads on LTH, feel free to add more. I am sure I could find more. Sorry if this one is so obvious, my other option was ByBy's, which is also more than deserving. Guess I am stuck in Mexican mode . Last edited by dicksond on March 27th, 2008, 8:39 am, edited 1 time in total. Since I'm at the Glen Ellyn location several times a week and *love* their food, I would be a bad customer if I didn't second this nomination. Been partaking of their wonderful food for 16 months now and haven't had a bad meal yet. There are only a few menu items I haven't tried; they are all great! Of course, since the name flashed before my eyes, must go for dinner tonight! If only they'd consider another location in Albany Park. We've been only to the La Quebrada on 63rd Street but have found to be a genuinely first-rate place for a quick and informal meal. The quality of the food -- from meat to salsas to tortillas -- is quite high and, while I cannot comment on other locations, I do think the one on 63rd is a place I wish I had in my neighbourhood and which I recommend to the LTH community as a whole. I suggest that the renewal of La Quebrada be limited to three locations, Roosevelt, 63rd Street and Aurora. I am comfortable with the quality of those locations, and I admit to having had some much less exciting meals at some of the other locations. I think Tony said it pretty well - fresh, reliable high quality food. In those three locations they also offer some interesting fare, though not as unusual as it once seemed. I still do go to La Quebrada a few times a year and can never remember being displeased. Those three locations are very much Neighborhood spots, doing a good business and drawing mostly from what seem to be families in the neighborhood. So I support that limited renewal. 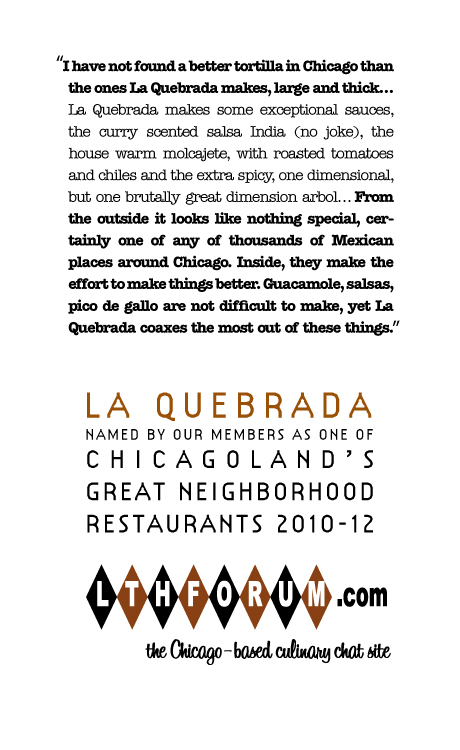 But I must say I do wonder whether anyone else still goes to La Q.
OK, there was a time when La Quebrada was different. There was the nearly illegible menu, with the intricate lines. There was the squid con chile arbol that my wife still wants to order, some multi-meat platters were added, a few other things have changed. So, this is not Gene n'Judes, but it's close. Lunch today was about as same ol'-same ol' as usual. A great start with the warm salsa molcajet (one of the best house sauces in Chicago); fresh made tortillas (none better that I know) wrapped around bits of cecina with guacamole, and barbacoa de chivo stuffed into another fresh masa product, a gordita. Likewise, the orchata is a standard bearer. I can see why, in its way, it does not seem exciting or even adventurous anymore. The bit of frisson of being across the street of a strip joint is long gone too. It remains a great neighborhood restaurant in the truest sense. It's been a stalwart in my family's eating out repetoire. I met the illustrious Dicksond and MHL for lunch today at the Cicero LaQuebrada. The place hasn't changed much over the last couple of years. The food was very good, but I left wondering when the next time I would think of LaQuebrada as the place to go for Mexican food since there are so may other places that I frequent much more often. Here are some pictures of our lunch. The food was very good, the tortillas were fleshly made, the horchata was cold and refreshing without being too sweet and the company was great. I can't remember the Mexican names for some of our dishes, so I'm hoping my dining companions (or anyone else) will chime in with their thoughts about the meal and the correct names of the dishes. I'm a bit conflicted about whether or not La Quebrada should be renewed as a GNR. The food certainly is good enough, but there seems to be a certain lack of support from the board. I'd love to hear some other posters' thoughts before the renewal deadline. Judging by the general lack of interest in attending our lunch, which was posted about on the events board, and the general lack of posts about LaQuebrada since the GNR was awarded (Not to mention the fact that the plaque is nowhere to be seen), I'm wondering if maybe LaQ's time has come and gone in terms of the conciseness of LTH Forum. I'm veklempt. Discuss among youselves. I ate at La Quebrada a few weeks back with Vital Info, so I feel qualified to comment. This is very much to my earlier point about not being bound by the legacy of the past. There was a time when La Quebrada was a hot discovery. That time was 2002-3, and other discoveries around the same time, which did not become GNRs, included Dona Lolis, Ixcapuzalco, By-By's, Restaurante Oaxaca, and Los Mogotes de Michoacan. All of which just goes to show, the conversation moves on. That's natural and good, and I'd say it's more than okay to let go of some of the stars of the past, in fact it's absolutely necessary. Let the GNRs be the best of the best, the most-talked about of the talked about, at this moment, because they're also only the beginning, and places that no longer quite draw the full attention will still exist in plenty of past posts and turn up from time to time. But the GNRs need to be places you can embrace wholeheartedly, not just places that you used to think were good but don't go to much any more. So yeah. La Quebrada. A good place, a place where I learned a few things, but a great place? I can't quite see that now. Lomo de res en chile de arbol. This was a great dish - browned steak in a rich and spicy chile sauce. I think those are the names of the dishes. I had an excellent meal, but I do agree that LTHForum has lost interest in La Quebrada. I would not be embarrassed to send anyone to La Quebrada, comfortable in the knowledge that they would eat well. So I guess it does come back to this simple question - can a GNR remain a GNR simply, but significantly, because it keeps doing what it is doing and doing it very well, or must it keep the buzz? Because that was a very good meal, but do I go out of my way to visit any of the La Quebradas? No. If it was in my neighborhood, would it be on my normal circuit? Yes. ByBys is an interesting reference, since I actually go there more often than La Quebrada. Is La Quebrada related to La Quebradita at 2907 W. Cermak? Or is it just a coincidentally similar name?The latter I've been to a lot and is a tiny jewel of Mexican food from Geurrero in a non-descript strip mall. My Mexican wife and I have taken Mexicans and Americans alike there and the reactions have been uniformly positive. Where is the Roosevelt location? I had lunch there with David Dickson (dicksond) and Steve Zaransky (stevez) recently, and was reminded of that range as well as the solid depth of their offerings, e.g., at least two different cecina offerings--one Oaxacan (with nopales and mushrooms) and the other Guerrero style (with guacamole). There's about a dozen seafood dishes, including a fish "filete" La Quebrada served with a shrimp/seafood sauce that we enjoyed as a nice counterpoint to the red meat entrees: Oaxacan-style Cecina and Lomo de Res en Chile de Arbol (see Steve's photos, upthread.) And, as I hoped, the fresh tortillas came costumed in their "Viernes" day-of-the-week-embroidered cloth that kept them demure, warm, and stylishly au courrant in their basket. Prior to those, before our sopecita-like appetizer of Picaditas Estilo Guerrero, there was the outstanding molcajete of steaming-warm, chunky salsa. To drink, we had some good, but unremarkable horchata. More notable for me was the post-lunch coffee, which had the lagniappe of cinnamon that catches my attention and impresses me--a little something extra that raises the experience to a slightly higher than expected level without fancy menu titles hype-ing the coffee--a good example of understated, but pervasive, quality. In the ongoing discussion about the must-be-buzzworthy criterion for GNR eligibility, I am of the view that buzz is significant but not absolutely necessary for current greatness as a neighborhood restaurant. I value La Q's consistency of quality and consider it as one of a small number of time-proven reference restaurants that I would employ as benchmarks in judging new ones. It was and is GNR material, and I see no indication that it would not maintain that level of performance for some time to come. Well, I can verify that the quality of the Aurora location (on route 23) is equal to Cicero, and others have verified that the California location is also up to snuff. So an argument could be made to include only those three. That does not change this fact - LTH members do not really seem to go and eat at any of the La Quebradas these days, so if we do require that the place continue to get our dining dollars to be a GNR, La Quebrada has failed that test. I say this sadly but with conviction. The food is good, the places are sympatico, is this not enough to deserve a GNR? Yes, I think it is. But probably not enough to receive a GNR, no matter how well deserved. We haven't been to the Aurora LaQ in a few months and I've got the itch. Nothing like the Filete laQ and a Modelo michelada. I know where we're going Friday night. I was introduced to LaQ by LTH - I was introduced to the michelada by LaQ. Vital Information wrote: It remains a great neighborhood restaurant in the truest sense. It's been a stalwart in my family's eating out repetoire. Mike G wrote: La Quebrada. A good place, a place where I learned a few things, but a great place? I can't quite see that now. ...And resonating with that satisfaction, I'm decidedly satisfied with the idea of La Quebrada on Roosevelt's maintaining its GNR status. I value La Q's consistency of quality and consider it as one of a small number of time-proven reference restaurants that I would employ as benchmarks in judging new ones. It was and is GNR material. DaveG wrote: We haven't been to the Aurora LaQ in a few months and I've got the itch. Nothing like the Filete laQ and a Modelo michelada. I don't see why La Quebrada wouldn't be renewed. The above alone is enough for me. Combine that with no fewer than four other posters recent (past two months) mentions of La Quebrada, with as far as I can tell, no noticeable reports of a decline in quality, and it seems like a shoo-in. I agree with AD. There are no self-fulfilling prophecies here, negative or positive, and the data continues to build with several days to go. Have some hope (and another michelada). I have gone to La Quebrada exactly once, though I don't know which location. I was pretty excited to try what everyone had been talking about. It wasn't a revelation, though maybe it may have been some years ago. While it was good, it wasn't great and certainly didn't stir me into wanting to go back again. If anything, it was curiosity satisfied with no compelling reason to go back just for it. Of course if I am in the neighborhood and not knowing of any place better, then I am there. People go to GNR restaurants with high expectations that I don't think La Quebrada provides. I guess if it adds to the 'neighborhood' justification. Being my food endevours have been mainly midwestern - I don't always know 'authentic'. When visiting restaurants - I generally look around at the other patrons nationality. Not to stereotype - but it can generally be a good indication of how authentic the food is, given the area. Back to LaQ (speaking only of the Aurora location). I've been ~10 times (in two years) and only one other time do I remember seeing a non-hispanic person in there. From a neighborhood standpoint - they aren't trying to cater to the masses. The decor seems like someone's home. It isn't full of the brighly-colored flowers, parrots and other ceramic knick-knack paddy-whack crap that is often litered through other 'Mexican' restaurants. Some might say it isn't clean - although the plates where my food goes, the table where my plate goes and the frosted mug (nice touch) that holds my michelada is always clean. I've never been served a dirty dish here - I can't say that about other places. It is no-frills great food. Aaron - you may have just proved that once we have a certain view of a place we do not even notice comments on it any more. Dave - you described the Aurora location perfectly, down to the concerns (at times) about how clean it is. The first time I went was a quiet Monday around 6, the place was mostly empty and half of it smelled strongly of bathroom cleaner. The next time was a Thursday at 8, the place was packed, musicians strolling through and it was almost all Mexican families with a few Anglos thrown in, but surely all families. No smell that time or any subsequent visits, but the place is neither fancy nor scrubbed clean. I would love to be wrong about its GNR and I personally support renewal. I was going to mention the mariachi band...they aren't very good. The vocals are loud. The guitar is out of tune. The locals don't mind - I don't mind. My friend insisted that we get the queso con chorizo appetizer which comes with the corn tortillas that I love so much. I love goat so got the goat barbacoa which was very tender and came with piles of guacamole, chopped onion, sliced jalapenos and other pickled veggies, chopped cilantro, and more of those tortillas. (Today's tortillas cloths were very cute; looked like something my grandma might have embroidered.) Oh, and a bowl of beans. My friend always gets the same thing--camarones al ajillo--so I got a bite: very garlicy sauce, as usual, which is a good thing. I don't come here more than once every six weeks--got the carne asada last time--but I've always had good meals here, the kind of comfort food I associate with a neighborhood restaurant even though this one isn't in my neighborhood, alas. I'm in favor of La Quebrada retaining the GNR. Sometimes, Michele, you are the very Soul of Brevity. Vital Information wrote: OK, there was a time when La Quebrada was different. There was the nearly illegible menu, with the intricate lines. There was the squid con chile arbol that my wife still wants to order, some multi-meat platters were added, a few other things have changed. So, this is not Gene n'Judes, but it's close. My family and I had dinner here tonight, and although I did not have either the barbacoa or the cecina, what I wrote above mostly applies. It's funny, because I do see the points of the arguments made in prior years about this renewal, especially MikeG's remark about this place being hep ca. 2002. On the basis of what's talked about, it's not a very talked about place. On the other hand, what's interesting to me, as a still very frequent customer, is the always evolving nature of La Q. Now, it's a special menu of $8.95 combo plates and slight oddities--pasta! For its denizens, it hardly rests on its laurels. Whatever the GNR-ness of the place, it remains high quality neighborhood food. It features certain dishes of the state of Guerrero, but it is not as highly regional as say Xni-Pic. There is also, no evidence of a chef or a strong individual hand. The moves get made behind the scenes, as if by a corporate chef. It is not like Taqueria Puebla with that family presence. Without that, it produces food in the classic Jim Leff scale of deliciousness. The hot, as in caliente not picante (although it is picante too) salsa is delicious. The hand made tortillas are delicious. The melted cheese is always delicious. Cheap cuts of meat are delicious. I'm resigned to whatever fate La Quebrada may have on this Forum, but I know that it will remain pretty much as I have always described it, and it will remain a stalwart of our dining habits. La Quebrada continues to be a GNR for me - delivering well-priced, authentic, well executed food at the two locations I frequent - Aurora and Roosevelt. Sure the menu has evolved a little, but I still like some sort of beef (usually cecina, or carne asada, but sometime a little pierna de pollo for a change) with a chile sauce, often chile de arbol. Maybe some nopales on the side, a glass of good horchata, a plate of huaraches to share with friends, and fresh tortillas and I am well fed and even better pleased. Two years ago I was surprised by the number of people who, like Rob and I, continue to go to La Quebrada but never post about it. And, like Rob, I understand I will need to be surprised once again in order for La Q to remain a GNR. Fair enough, but if you go, you will not be disappointed. I had a pretty good experience at La Quebrada when I went last Friday. It was my first time there too. The menu is a book and drew comparisons to Ameri-chinese menus in its breadth. However, I found myself struggling to choose what to order. Why? Because while there were a lot of choices, there didn't seem to be any specialities or things that are unique to them. The menu was full of all the classic Mexican fare that you'd find in any late night post-bar hang out - tacos, enchiladas, flautas, carne asada, etc. They even had a section of "pasta" made with a chipotle cream sauce. After asking to be last to order, I settled on the Miniparriladas Combinacion Mix 1/2 grilled steak, chicken and seafood with cheese and potato. Despite having a blah selection on the menu, the food did stand out as better than your corner joint. The chips were made from scratch, not from leftover tortillas. And they had a fresher corn flavor than what you'd normally get. Though the salsa was a big runny, it had a nice roasted flavor. The tortillas that came with our main course were thicker and fresher, also made from scratch and pressed by hand. I was really happy with my main course too. While I expected some of the meat to be overcooked when it came out on a sizzling platter, all the meats were tender. It was these little touches that made me quite satisfied with the meal. I'm glad I'm not the only one writing on this today. This AM, my wife had a strong urging for La Quebrada's chiliquiles; actually, I should say that she had a strong urging for chiliquiles and she knew that this urge would be best satisfied here. I had said 1/2 way through our meal (and I have a twitter feed to prove it), that I needed to post on GNR support. 'Cause, after all these years, this place still got it. I used to say La Quebrada was my signature "find" on Chowhound/LTH. I said this for two reasons. First, I'm pretty sure I was the person to post about the place, and second, after that posting other people came along and enjoyed themselves here. Yet, when I look back at that, especially against the back-drop of today's meal, it seems somewhat absurd. As the poster above notes about the menu*, it seems rather quaint now to realize how thrilled I was when I first "found" the place, and the thrill I got in posting about it (as well as sending Chowhounds and the Tribune there). My wife reminded me today that she was the one who had actually "found" it. A day before our first visit, she had passed it on the way to the Chicago Food Depository. She was impressed by the size of the audience and the sign for hand made tortillas. We tracked it down the next day, and the results were eventually GNR-ship. It's still a GNR, and I'm glad we found this place. Maybe today it would not have jumped out at me the way it did 10 or so years ago. I like the Chinese menu analogy above, although this AM I was using Greek Coffee shop. In fact, when I put the pic on Instagram/Twitter I was gonna say Omega, but I was not sure if that would pierce the collective. It's place as a regionalist--man it took me a long time to figure what exactly where the Quebrada--has been diluted with the menu. So. The bottom line then, and now, is that it put's out food that is so fun to eat. It puts out food that is so plain satisfying. Maybe now I'm just not as surprised by a place like this doing that. It does that with it's house molcajete sauce. It does that with it's thick cut steak or thin cut cecina. It is the food, for sure, that we all think we've moved on from, but are instantly lured back when fed it. I may not talk about this place that much any more, but I like it all the same. *La Quebrad= Acapulco cliffs, and at it's core, it's specialties are of Acapulco and its state of Guerrero. In fact the great RST argued that the quality of their tortillas was a direct result of this geographical relationship at the state of Guerrero is know for their tortillas. Other Guerrerese specialties on the menu include the Teleopan mole, the picaditas, the goat, the cecina, and the ceviche.